Walking can be hazardous. But "puffin" crossings are one way to make pedestrians safer. Photo via webax.it. The next time you hear your transit geek peers arguing about the merits of puffins versus pelicans, you’ll be able to join in the debate! This post was inspired by a discussion on a sustainable transport listserv about which kind of pedestrian crossings should be installed in certain intersections in Indian cities. Most of the animal-inspired crosswalks are of British origin and are mostly found in the U.K. or countries with U.K.-influenced transit engineering policies. Here’s a little primer on zebra, pelican, puffin, toucan, hawk, pegasus and Barnes Dance crossings. 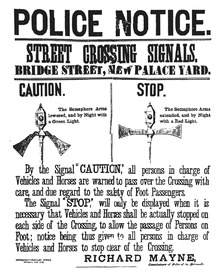 The first pedestrian crossing signal was installed in London in 1868, but it was controversial and quickly removed. Image via Wikipedia.org. Crosswalk markings should be provided at points of pedestrian concentration, such as at loading islands, midblock pedestrian islands, and/or where pedestrians need assistance in determining the proper place to cross the street. The MUTCD also calls for thorough engineering studies before crosswalks are installed, to prevent “indiscriminate” use. However, the MUTCD does not provide guidance on the specific conditions — e.g. traffic volume, pedestrian volume, number of lanes, or presence of median — that determine whether a marked pedestrian crosswalk should be installed. According to the FHWA, decisions about where to place crosswalks have been left to state officials and local traffic engineers, stirring controversy over the optimal conditions for crosswalk use. This controversy is heightened by studies that have found crosswalks decrease pedestrian safety in certain cases. 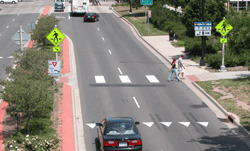 The type of crosswalk installed can also make all the difference for pedestrians’ safety. Many U.S. cities use variations of the zebra crossing, but have trended toward using zebra crossings because of they are more visible to drivers. Image via FHWA Pedestrian Facilities Users Guide. In 1951, animal-themed pedestrian crossings were born with the zebra crossing. Zebra crossings get their names because they’re marked with black and white stripes of equal width across a road; in the U.K., they are generally accompanied by flashing amber beacons known as belisha beacons on both sides, meant to alert drivers. Zebra crossings are sometimes called ladder crossings in the United States, and the FHWA designates zebra crossings as having diagonal stripes. These are generally the first crossing that come to mind when on thinks of pedestrian crossings. However, they generally lack sufficient signage warning oncoming drivers — particularly when they are installed in uncontrolled locations — and can instill pedestrians with a false sense of security, lowering their concentration on traffic around them and reducing their safety. Behavioral psychology studies looking at pedestrian and motorist behavior are therefore an integral component to analysis of best practices for pedestrian crossings. To make zebra crossings safer, cities have added traffic calming signs warning motorists, and yield lines set behind the crosswalk with signs saying “yield here to pedestrians,” flashing overhead lights and lights in the street to warn motorists to stop. 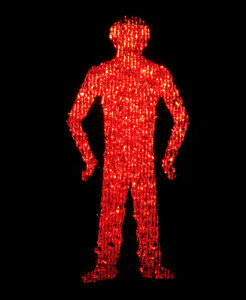 The red man is shown in a standing position to reduce confusion for color-blind people. Image via Dominic's pics. 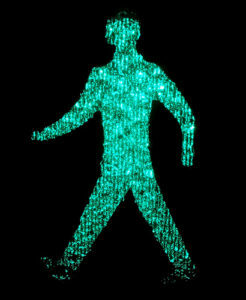 In many pelican crossings, a green man walking lights up when pedestrians can cross. Image via Dominic's pics. Pelicans are most common in the U.K. and countries like New Zealand that have strong British transport engineering influence. Many pelican-style crossings in America include zebra crossings, and some crossings that look like pelicans are really not pedestrian-controlled anymore, since the advent of computer-controlled traffic lights. Variations on the pelican crossing include signals that count down the seconds left until the light changes. These signals are common across the United States — including in Washington, D.C. and New York — and are now being trialled in the U.K.
One problem with conventional green man/red man pelican crossings in the U.K. is their blackout period: on some pelicans, the green man disappears but the red man hasn’t lit up, which confuses pedestrians. Such crossings are being phased out in the U.K. And in the United States, the latest version of the MUTCD requires countdown lights to be phased in at all pelican crossings over the next ten years. Boulder zebra crossings are enhanced with pelican push-button crossing technology. 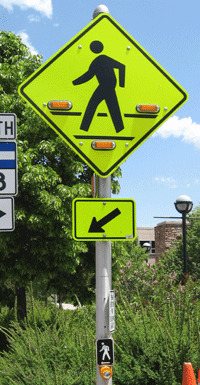 And pedestrian actuated lights on signs by crosswalks alert motorists when people are crossing. Photo via BoulderColorado.gov. Lights controlling pedestrian traffic on the near side – set diagonally to the road’s edge – rather than on the opposite side of road. These are meant to improve ease of monitoring signals and traffic at the same time. These lights also cater to pedestrians with poor eyesight, who often cannot see lights across the street. On-crossing sensors allow pedestrians to “extend” their cross signal, because they do not allow the light to change while slow-moving pedestrians are detected in the crosswalk. In addition, they improve efficiency by canceling unwanted pedestrian demands so traffic is not stopped unnecessarily. If no one is detected in the crosswalk, clearance time is minimized. This minimizes vehicle delays, particularly at midblock crossings. Puffins were designed to improve road safety. However, according to the DfT’s Puffin Good Practice Guide, studies on their effectiveness have reached contradictory conclusions. And, as we’ll discuss later on, they’re expensive. Toucans are used in the UK to allow cyclists to cross with pedestrians. They use on-crossing detectors, like puffins, and cost about the same as puffins to install. Photo via newcastle.gov.uk. Toucan crossings got their names because they’re built for two to cross: pedestrians and cyclists. 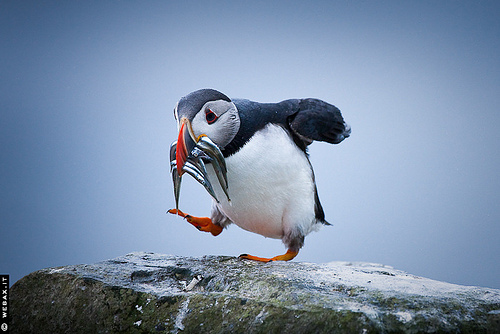 They are similar to puffins, but they’re wider. Pelicans, puffins, and toucans are usually accompanied by zigzag markings before the crosswalk, to alert motorists that they’re approaching the crosswalk. Pegasus crossings integrate horseback riders, including higher buttons for people on horseback. The Tucson Department of Transportation came up with hawk crossings and installed five in 2004; there are now 40 hawks in operation. When not activated, the signal is blanked out. The HAWK signal is activated by a pedestrian push button. The overhead signal begins flashing yellow and then solid yellow, advising drivers to prepare to stop. 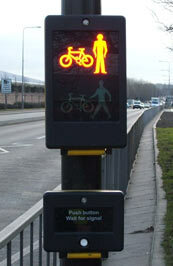 The signal then displays a solid red and shows the pedestrian a “Walk” indication. Finally, an alternating flashing red signal indicates that motorists may proceed when safe, after coming to a full stop. The pedestrian is shown a flashing “Don’t Walk” with a countdown indicating the time left to cross. To determine where HAWKS are most necessary, Tucson uses a HAWK priority evaluation form that consists of ten questions about accidents and traffic at the specific intersection. 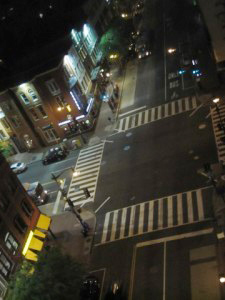 Preliminary studies of hawks have been promising; and in August of 2009, a hawk pedestrian signal was installed in Washington, D.C. at a crossing on upper Georgia Avenue, NW. A new Barnes Dance crosswalk at the intersection of 7th and H Streets NW in D.C. Diagonal lines help guide pedestrians. Photo via wtop.com. all sides and pedestrians can cross an intersection in any direction they please. The Barnes Dance got its name from traffic engineer Henry Barnes. Barnes was traffic commissioner in cities like New York, Denver, and Baltimore in the mid-twentieth century, and strongly promoted the crosswalk. Recently, the D.C. Department of Transportation (DDOT) piloted a modified Barnes Dance at one of the city’s most traversed intersections — 7th and H streets NW, in Chinatown. Unlike a conventional Barnes Dance crossing, where pedestrians are only given the “walk” signal when traffic is stopped in all directions, pedestrians at 7th and H streets will also still be able to cross with traffic that has a green signal. In addition, according to DDOT, unlike your every-day Barnes Dance, “this enhanced Barnes Dance will prohibit all turns by all vehicles at that intersection,” improving pedestrian safety. There’s no short and simple answer, which is part of the reason there’s still no standardization of pedestrian crossings in places like the United States. 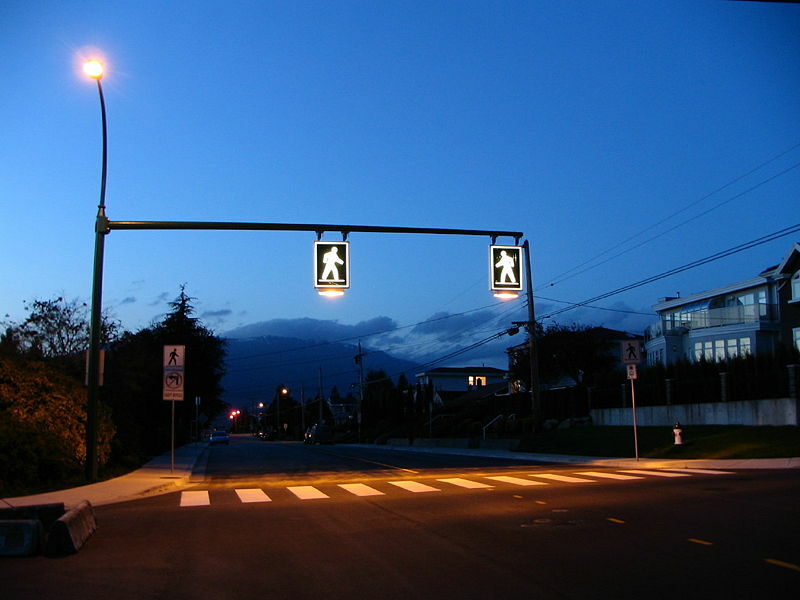 A zebra crosswalk in Burnaby, BC, Canada is enhanced with lit overhead signs. Photo via wikimedia.org. In general, there is a trend toward enhancing traffic calming features at crossings. In the United States, studies have found that pedestrians generally walk slower than the 4 feet per second that the MUTCD identifies as “normal,” which makes traffic calming measures even more crucial. These include raised crosswalks, better and more visible signs and road paint, extra “yield to pedestrian” lines before the crosswalk, or restricting right turn on red, rather than installing more high-tech, expensive crossings. Pelican, puffin, and toucan crossings cost between $50,000 and $70,000 to install. 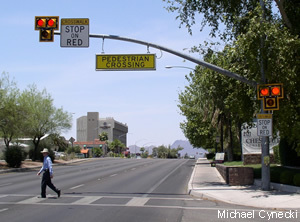 Flashing signals to warn motorists if pedestrians are present. 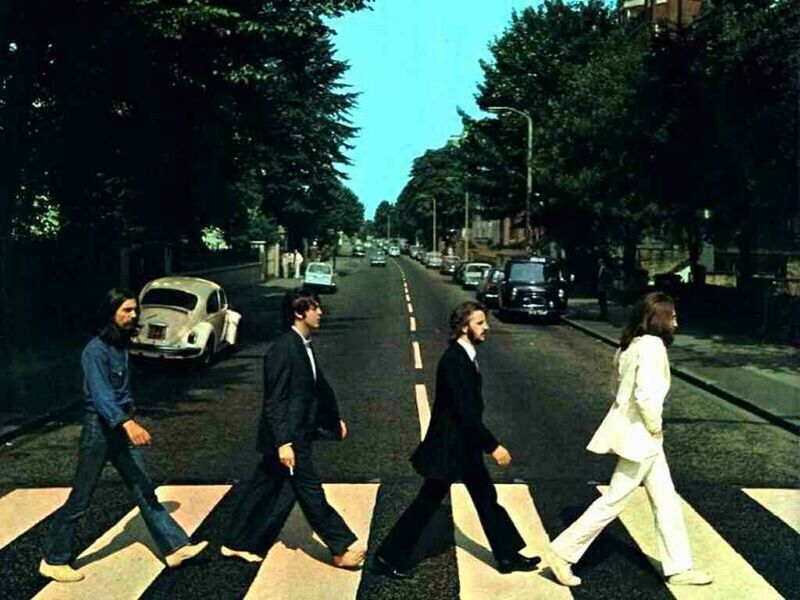 The world's most famous zebra crossing, walked by The Beatles at Abbey Road. The photo doesn't show the beacons at either end. Image via gameslatest.com.